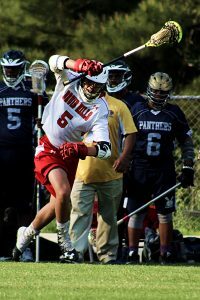 Javon Harris-Matthews scored his fifth goal of the game in the second overtime of a non-region lacrosse match at Druid Hills to give the Southwest DeKalb Panthers a 10-9 victory against the home-standing Red Devils on Tuesday night. The Panthers (1-12) never trailed in the game and led by four three times before Druid Hills (3-8) put on a furious fourth quarter rally to send the game into overtime. Southwest’s Calvin Scott scored his second goal of the game by swinging to the left side and sending a shot into the right corner of the goal to give the Panthers what seemed like an insurmountable lead at 9-5 a couple of minutes into the fourth quarter. The goal answered one by Druid Hills’ Zach Milner to open the final period of play that had cut an 8-4 third quarter lead to 8-5. As the Panthers ran down the clock with movement and passing, the Red Devils’ chances were getting less and less until Windham Reeder took a pass from Milner to put a shot into the goal to cut the lead back to three at 9-6 with less than eight minutes to play. Moments later Chase Santa Maria used a clean pass from Palmer Cornwell for a low fast shot into the right corner of the net to pull Druid Hills within 9-7. The clock continued to cut into the time Druid Hills had left to score, but Ross Deutsch made it a one-goal game with about two minutes to play as he slung a low shot into the net to close the gap to 9-8. 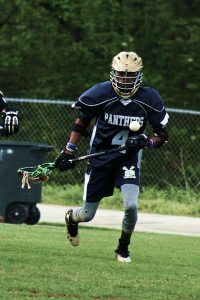 Druid Hills was in hurry up mode as the clock ticked below a minute to play and won its fourth consecutive face off as Tyrique Robinson got control of the ball. The ball made its way into the stick of Reeder once again. The Red Devils junior got caught in a crowd of Southwest defenders and spun away to get a shot off that found its way into the net for his fourth goal of the game with 11 seconds to play to knot the game at 9-9. The Red Devils won the face off again, but following a timeout with three seconds to play could not get a shot off to send the game into overtime. Neither team could score in the first overtime before Harris-Matthews got the game winner in the second period of extra play. Southwest got off the bus in attack mode and Harris-Matthews scored three goals in the opening period for a 3-1 advantage at the end of the period. The lone bright spot for Druid Hills was Reeder’s first goal of the game. Charles Broome and Uno Fields both scored early in the second quarter to extend the lead to 5-1. Reeder picked up his second goal of the game on an assist from Deutsch to close the gap to 5-2 at the half in favor of the Panthers. Santa Maria and Reeder teamed up for two quick goals to open the second half with Reeder passing twice to Santa Maria as Druid Hills cut the lead to 5-4. The Panthers answered with three consecutive goals by Jordan Edwards, Scott and Harris-Matthews for the 8-4 advantage to end the third period.